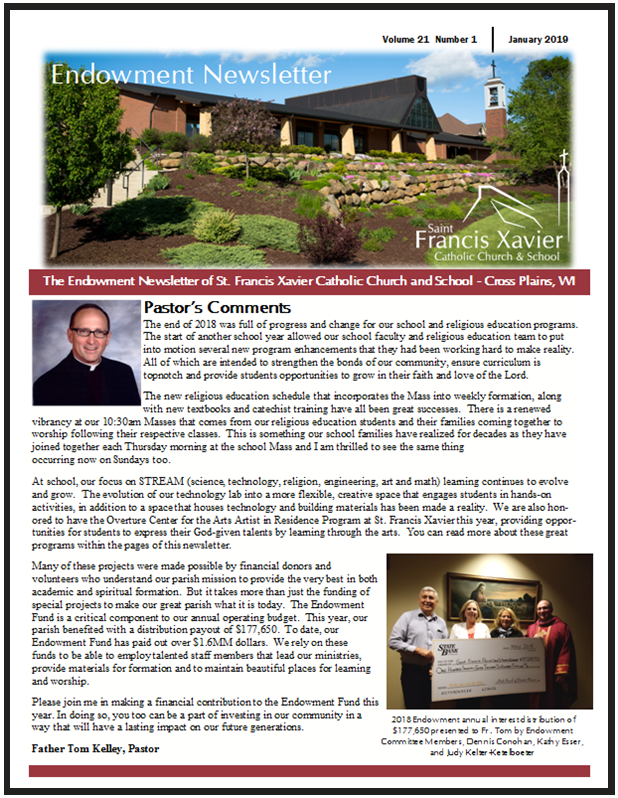 The 2019 Issue of The St. Francis Xavier Endowment Newsletter is now available! It is filled with great articles about our school and alumni and celebrates all those who generously give to our Endowment Fund. Learn more about the importance of our Endowment Fund here! The St. Francis Xavier Endowment funds is an investment fund that was established by Msgr. Healy and the leaders of St. Francis Xavier school back in the early 1980s. Our finance council monitors the fund and makes annual withdrawals from the invested capital. That capital is then utilized to help fund our school and religious education programs. Our endowment fund holds its principal in perpetuity and only pays out a small portion annually. Our goal for the endowment fund is two fold: to grow the principal and to generate income, that our parish relies on each year. Why Support the Endowment Fund? A gift to the endowment fund allows you to support St. Francis Xavier and our mission of teaching children in the faith in perpetuity. Your gift, large or small, will allow us to continually grow our fund, providing financial sustainability for generations to come.